The USI Geneva hot drink merchandiser is ADA compliant and will 11 major selections and up to 34 beverage combinations of coffees, hot chocolate, tea, cappuccino, and espresso. The USI Geneva vending machine is available in a fresh brew coffee model and a freeze dried coffee model. Standard capacity is up to 384 twelve ounce cups and up to 400 seven ounce cups. The Geneva fresh brew coffee vending machine can be financed through the factory’s in-house finance company, USI/Inland Finance, with zero down payment and up to 36 monthly payments of $223.63. 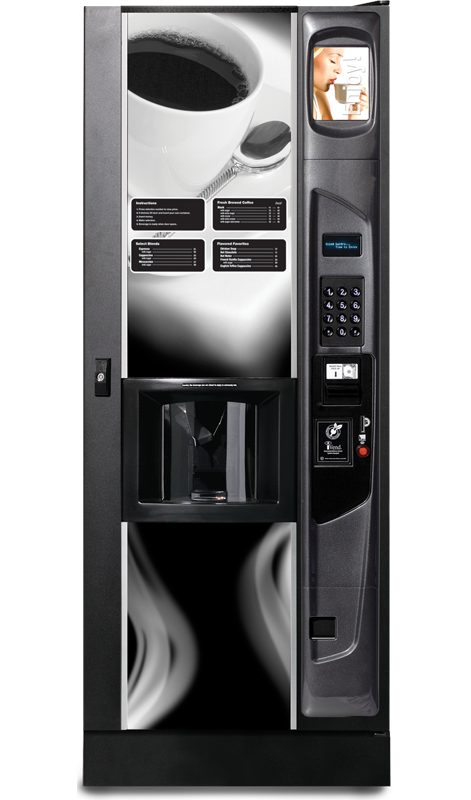 The freeze dried coffee vending machine can be financed with zero down payment and up to 36 monthly payments of $195.04. Net 30 terms as well as ninety day interest free financing is also available. The price of both models of the Geneva Hot Drink Merchandiser includes coin mechanism and bill acceptor. Both Geneva models are also credit card compatible and have a two year parts warranty. 72 inches high. 27.5 inches wide. 28 inches deep.